Book an experience like none other in the St. Croix River Valley! Each one of the Transportation Museum’s excursions give the riders a feel for the past and create an unforgettable experience. Whether the trip booked is to Marine on St. Croix MN or Dresser WI, riders will travel on a historic passenger car pulled by our vintage locomotives. All trains depart from 114 Depot Rd, Osceola, WI 54020. Our First Class Dinner is truly a special and upscale experience. The dining staff provide black tie service perfect for celebrating an anniversary, special achievement or unique night out on the town. 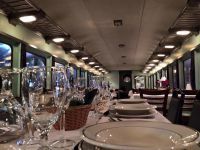 Savor your three-course meal with a glass of wine while you enjoy the company of friends and family as the train rolls through the St. Croix Valley. Watch the magnificent scenery of the St. Croix Valley roll by as you share a glass of champagne or sparkling juice with friends or family. Enjoy a classic American style brunch and then roam around the passenger cars to learn more about their history from one of the car hosts. ​Munch on pizza pie while you and the family cruise down the line to Marine on St. Croix on a 1914 Rock Island coach car! 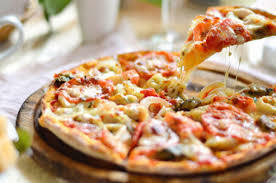 Each passenger is served up a personal pizza from Village Pizzeria, soda, and one of Pizzeria’s signature chocolate brownies. After grabbing a bite to eat, roam the cars to learn about their history. When you book your coach ticket, be prepared to step back in time and ride in style just like travelers did nearly 100 years ago. Every Saturday and Sunday, enjoy riding the rails through the St. Croix River Valley in our historic passenger cars. Of course, riders are encouraged to move around the cars and learn more about the car from one of the car hosts. Special seasonal train excursions are planned throughout our scheduled season. These rides provide an opportunity to enjoy riding the rails with a flare of an upcoming holiday. Riders can book tickets for a special July ride to Marine on St. Croix and enjoy fireworks, or enjoy the shades of autumn on the Fall Colors train. These rides are about 90 minutes round trip and are very family friendly. The finale of the season is the Pumpkin Express Train & Bash, a trip to the Dresser Depot where families can enjoy a pumpkin patch, story walks, and more seasonal fun. This excursion is a popular way to enjoy riding the rails with the Transportation Museum.